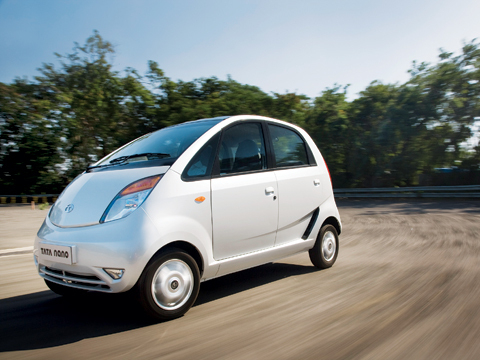 / Future Cars / 2010 Tata Nano – What’s the Big Idea? There is a chance – just a chance – that this odd-looking little bubble of a car, with its dime-size wheels and tiny tailpipe and weird two-cylinder whir, might turn out to be the Ford Model T of the twenty-first century. True, there’s plenty that might prevent the new Tata Nano from causing the seismic shock that some predict it will inflict on the global car industry. But like other transformative cars, it has a quantum-leap quality. The Model T revolutionized how cars are made, the Mini rethought how they’re laid out, and at $2500, the Nano turns upside down our previous ideas about how much cars should cost. What you, me, and everyone else who cares as much about a car’s dynamics as its dollar value wants to know is how the Nano drives: surely a whole car that costs less than some upholstery or audio upgrades must be terrible, right? Not remotely, and we’re in a unique position to tell you. We haven’t driven it, but we’ve been to Tata’s test track in Pune, India, and scored a ride in the Nano. Nobody else outside Tata has experienced it “in action.” Tata is very protective of its new baby, and it didn’t mean for this to happen and isn’t very happy that it did. It won’t happen again for a while. But before we tell you what we thought, it’s worth seeing this car in context. Tata Motors might have grabbed the world’s attention in 2008 with the unveiling of the Nano and its purchase of Jaguar and Land Rover, but it has been making trucks in India for more than fifty years. When Ratan Tata took over as chairman of this family-owned, 140-year-old, impossibly diverse, tea-to-IT conglomerate in 1991, he decided to make cars, too. From scratch, he built Tata Motors into India’s third-biggest carmaker in a market which, although now slowed by the same economic misery as everywhere else, has seen sales skyrocket from 40,000 in the mid-’90s to nearly 2 million today. When growth resumes, billion-strong India will dwarf European markets and join the United States, China, and Japan as an automotive superpower. Tata Motors’ lineup might seem pretty freaky by Western tastes, but the company has grown by understanding exactly what its customers want. It already does cheap very well. The Tata Magic is a 700-cc minivan with fabric bodysides that sells for about $5800. It has eight seats but typically carries far more and is exactly what rural Indians need – very cheap, with room for the whole family. But it wasn’t cheap enough for Ratan Tata. Despite Bollywood leading-man looks, he is genuinely shy, and such is his monastic devotion to his business that he has never married and lives alone in a Mumbai apartment with his dogs. The Tata family is Parsi, and Ratan has repeatedly said that his overriding aim in business is to be able to lay his head on his pillow at night knowing that he has not harmed anyone. 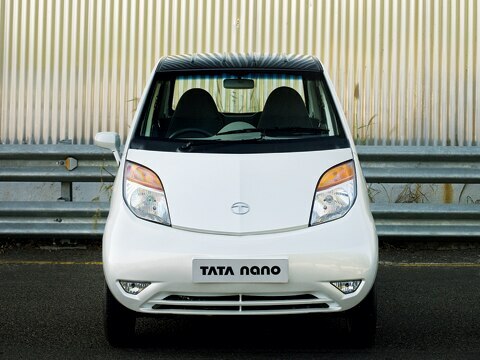 So if the Tata Nano sounds more like a social mission than another new-car project, that’s because it is. India’s insane traffic claims more than 90,000 lives each year, and the vast majority of victims are on two feet or two wheels. Appalled by this carnage, Ratan decided to create a car that fathers carrying a family of four on a scooter might be able to afford, and so told his engineers to create a car costing no more than one lakh (100,000 rupees), or a little over two thousand bucks. He couldn’t have been blind to its commercial potential, but when you meet him, you’re left in little doubt that his commitment to corporate social responsibility runs rather deeper than the usual executive claptrap. When news of the project first started to leak three years ago, insiders told us to expect something utterly uncarlike to get the price that low, maybe with a fabric roof and no windows. What we got – when the unveiling of the Nano in January last year garnered more attention for New Delhi’s motor show than Detroit’s – was something that looked more like a conventional Japanese or Korean city car than Fred Flintstone’s ride. As expectations rose, the world’s economy plummeted, and suddenly a two-thousand-dollar car looked very appealing to a whole lot more people. But Tata isn’t immune to the downturn. Its $2.3 billion purchase of Jaguar and Land Rover looks badly mistimed. It has been hit hard by the slowdown in the Indian car market and is finding it hard to raise capital. And it was forced to abandon the Nano’s virtually complete plant in West Bengal after riots by displaced farmers and start from scratch in Gujarat at a cost it can barely afford, putting volume production of the Nano back about six months. The speed at which Tata can ramp up production in India and then begin the exports and overseas production that will make this car of global impact will be slowed; in that time, others might copy it, or we might haul ourselves out of recession and decide we don’t need or want a car this cheap. Revolution, or footnote? The way history will view this little car hangs in the balance. 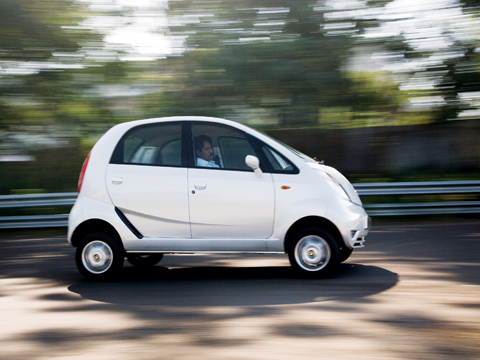 So a low price alone won’t be enough; the Nano will have to perform at least a little bit like a “proper” car. And it does. You open one of four very light, flimsy-feeling doors and enter a remarkably airy cabin. The whole car is only 122 inches long (sixteen inches longer than a Smart ForTwo), but with the engine under the rear seats and virtually no nose, almost all of that is usable cabin space, with one six-footer able to sit comfortably behind another. The seats are firm, the cloth in which they’re trimmed feels of decent quality (base models get vinyl upholstery), and the big one-piece dash molding with its central speedometer is made of a surprisingly good-looking plastic. A Tata engineer takes the wheel and starts the 623-cc, 33-hp SOHC two-cylinder engine. The engine note sounds worryingly similar to the putt-putt of the two-stroke scooters Nano buyers will be trading up from, and when two more Tata engineers jump in the back for the ride, I start to worry about the engine’s ability to cope. An unladen 1322 pounds is an impressive curb weight for a four-seat car, but 33 hp sounds less impressive when confronted with nearly a ton of car and passengers. But the smiling, confident guys in the back seat plainly know something I don’t, and the Nano moves off with, if not vigor, then certainly a surprising lack of sloth. Don’t be fooled by the estimated 17-second 0-to-60-mph time; the Nano will get to 60 mph but is almost out of puff, so adding those final few miles per hour takes a disproportionately long amount of time. To 30 or 40 mph, the Nano easily feels quick enough to keep pace with other traffic, and even when worked hard, the tiny engine doesn’t get too shouty or coarse. Pushed hard around bends, the Nano rolls hilariously, but its tiny twelve-inch front tires cling gamely to the pavement. You’re unlikely ever to drive a Nano this way, particularly in the traffic stasis that afflicts most Indian cities. The ride and refinement are more relevant, and the Nano lopes along quite nicely on those little wheels, never transmitting too much harshness to the cabin, even over poor surfaces. So if they haven’t made it a punishment to drive, how have they made it so inexpensive? First, Indian labor is cheap. Second, there’s no safety equipment; no air bags, antilock brakes, or stability control. But in comparison with a scooter, doors and seatbelts count as safety features. And third, there’s a lot of clever thinking that went into this car. There’s no trunk or fuel-filler hatch; too many stamped panels, springs, and latches. So instead, all the fluids are refilled under the tiny hood, and you get at the small trunk by flipping the rear seats forward. There’s only one wiper and just three bolts per wheel. And it’s designed to be cheap to manufacture; the entire rear mechanical package – engine,transmission, suspension, the works – attaches with just four bolts. The only factory options are air-conditioning and electric windows; everything else, including the radio and the optional aluminum wheels, will be fitted by your dealer, who will also be able to add A/C later if you can’t afford it at first. This is how they’ve done it: identify the bare minimum standard of accommodation, appearance, and performance, take out everything that is unnecessary, and rethink everything that has to stay. The Nano won’t compete with “normal” cars on dynamics or quality or anything other than smarts, because it doesn’t have to. But it will do 80 percent of what an $8000 Korean city car will do at about 30 percent of the price. All of that assumes, of course, that Tata can hit its price target. It won’t commit publicly, and after taxes and the dealer’s margin, an Indian buyer is likely to pay closer to $2600. But it’s still pretty hard to argue with the equation. And if you need any more convincing, this car imparts that peculiar sense of self-satisfaction you get from experiencing something willfully different and clever, such as an original Mini or a Citron 2CV, both of which were paradigm-shifting cars. With the Nano, you get that same feeling. NO HATCH To minimize panel stampings, the rear hatch doesn’t flip open. The tiny cargo area is accessed by folding the rear seats forward. THREE LUGNUTS The twelve-inch wheels use only three lugnuts, rather than the typical four or five. SIDEVIEW MIRROR Only the driving position gets a side mirror. A passenger-side mirror is a dealer-installed option. TINY HOOD All fluids are refilled under the small hood, including the gasoline. Note the absence of an exterior fuel-filler door. ONE WINDSHIELD WIPER By using only one wiper to clean the front glass, both material cost and assembly time are lowered. You’ve been forced to withdraw from the Nano factory in West Bengal after violent protests. What impact will this have on the Nano’s introduction? We stopped because of continued violence, fear, and intimidation of our employees. That’s not sustainable on a daily basis. You end up handling that, and not production. This is perhaps the first time this has ever happened, where you create something of this scale, uproot it all, repack it, cart it away, and reinstall it elsewhere. It’s certainly more complex than putting something fresh on the ground. At this stage, there’s no time frame for the start of production at the new plant. But the customer isn’t interested in our problems. He just wants the product, so we’re looking to see how we can produce it in our other factories first with just a few months delay. Will it still cost the target amount? You’ll need to wait until we launch the vehicle, and you will see for yourself. How do you respond to criticisms from environmentalists about the effect of making cars significantly more affordable? That’s an interesting perspective from those who already own cars. It’s very hypocritical for people who drive four-wheelers to say this. Let them sell off their vehicles if they are so concerned and travel only by public transport. This car will have one of the lowest CO2 emissions, so perhaps critics had better change to this car anyway. How is the relationship with Jaguar and Land Rover developing? It is genuine, transparent, and trusting. With Tata, whatever we are, we are. We are not saying something and thinking something else, or doing yet another thing. With Mr. Tata, you feel he is a person who is going to look after you.